Inch High using Braveheart's eye as a mirror. 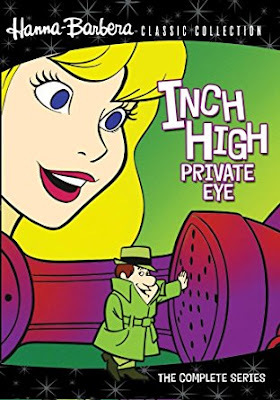 Inch High, Private Eye was a Hanna-Barbera cartoon inspired by Get Smart. The series centered around the diminutive titular character (Lennie Weinrib, doing a combined impersonation of Jack Benny and Don Adams) who was a bumbling detective for the Finkerton Detective Agency (a play on the Pinkerton National Detective Agency, now known simply as Pinkerton). Inch wasn’t always a man of his stature, as a scientific formula gave him the height he deemed a boon for his work (makes you wonder how his parents came up with his name). He was often tasked with foiling the complicated schemes of various thieves who wanted to steal rare items. However, many of these crimes happened under his nose, painting him as either incompetent or as the thief himself. Lori, Gator and Braveheart in the Hushmobile. Inch’s bosses, Mr. and Mrs. Finkerton (John Stephenson and Jean Vander Pyl, respectively), didn’t particularly care for the diminutive gumshoe and took every opportunity to threaten his job; either outright firing him or replacing him with a mechanical flea. Aiding Inch in his duties was his niece, Lori (sometimes spelled “Laurie”, voiced by Kathy Gori), her muscle-bound hayseed boyfriend, Gator (Bob Luttrel), and the ironically-named St. Bernard, Braveheart. Inch communicated with his friends through a special make-up compact Lori carried. 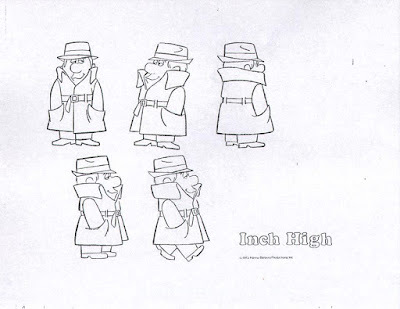 Inch High debuted on NBC on September 8, 1973. The series was written by Fred S. Fox, David P. Harmon, Seaman Jacobs, William Raynor, Gene Thompson and Myles Wilder, and featured music by Hoyt Curtin. One of Hanna-Barbera’s less-remarkable or memorable efforts, it only ran a single season of 13 episodes and only made a comic appearance in Gold Key’s Hanna-Barbera Fun-In #14, later reprinted in the United Kingdom as Inch High, Private Eye & Pixie & Dixie Annual by Brown Watson. Inch High was also featured on a lunch box by Thermos, sharing the honor with Goober and the Ghost Chasers. 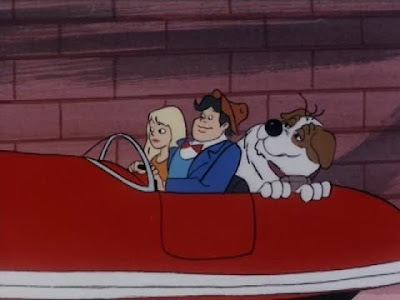 The series did make a return to television in syndicated rerun programming such as USA Cartoon Express, the Mysteries, Inc. block on Cartoon Network, and on Boomerang. 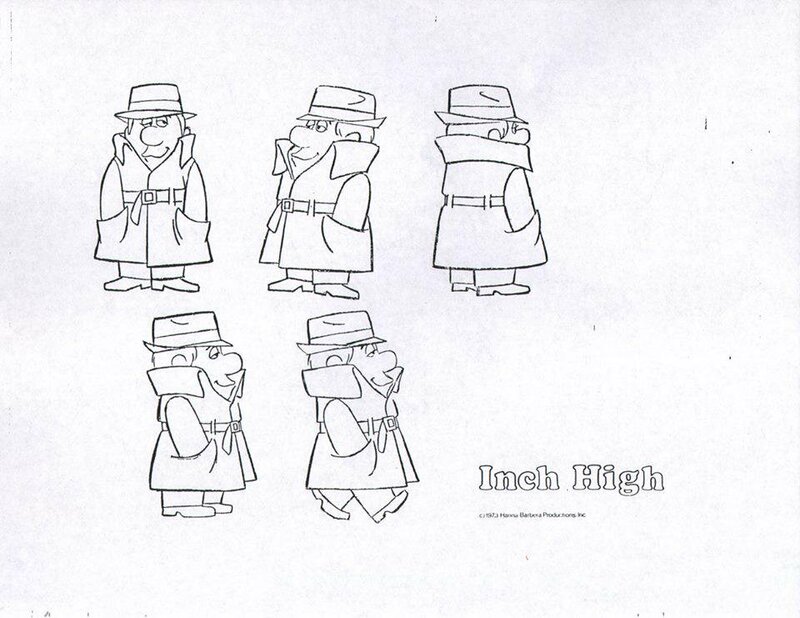 On Cartoon Network, Inch was featured in a commercial that had him teaming-up with Batman…with disastrous results. He also appeared on an episode of Harvey Birdman, Attorney at Law in a height discrimination case, voiced by Maurice LaMarche. In 2012, Warner Archive released the complete series to DVD as part of their Hanna-Barbera Classics Collection. “Diamonds are a Crook’s Best Friend” (9/8/73) – Inch High is called in to investigate a shadowy figure after Mrs. Gotrocks’ diamonds. “You Oughta Be in Pictures” (9/15/73) – Chasing a diamond thief lands Inch High trapped inside a book. “The Smugglers” (9/22/73) – Investigating a smuggling operation leads Inch to recover an empty crate and be forced out on vacation. “Counterfeit Story” (9/29/73) – Inch investigates the replacement of money in banks with counterfeit cash. “The Mummy’s Curse” (10/6/73) – Inch heads to Egypt to investigate a mummy causing chaos. “The Doll Maker” (10/13/73) – A dollmaker plans to use an army of dolls to steal all the fur coats in town. “Music Maestro” (10/20/73) – Inch notices a pattern between a rash of thefts and where a particular symphony plays. “Dude City” (10/27/73) – Inch trades his old friends for new ones at a dude ranch, until he learns his new friends are actually crooks. “High Fashion” (11/3/73) – A fashion designer plans to kidnap his competition. 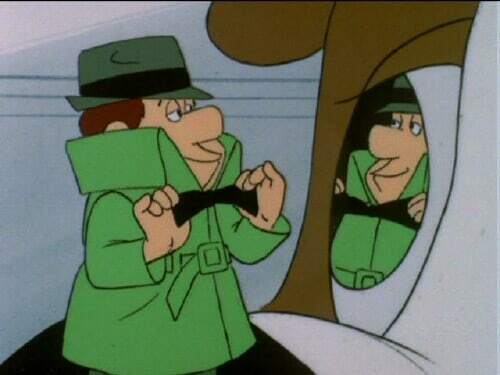 “The Cat Burglars” (11/10/73) – An art thief uses a special rubber formula to commit impossible thefts. “The World’s Greatest Animals” (11/17/73) – A crooked ringmaster has his men steal animals for his circus. “Super Flea” (11/24/73) – A new mechanical super flea detective threatens to replace Inch, but Inch has to find it after it ends up stolen. “The Return of Spumoni” (12/1/73) – The dollmaker returns for revenge on Inch and plans to steal a statue he’s guarding.